Refrigerate after opening and consume within 7 days. 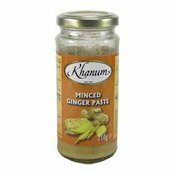 Ingredients: Ginger (87%), Water, Vegetable Oil (Rapeseed Oil), Sugar, Salt, Acidity Regulator (Citric Acid [E330], Acetic Acid [E260]). Simply enter your details below and we will send you an e-mail when “Minced Ginger Paste (薑蓉)” is back in stock!